Come Join Us! Everyone is welcome on Saturday, December 8, 2018 at 3 PM. 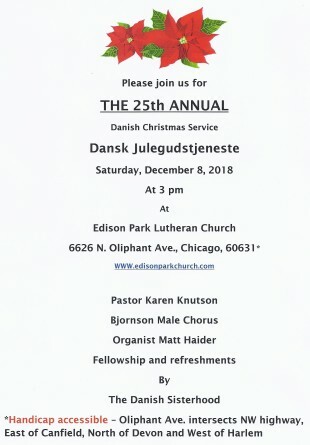 The 25th Annual Danish Christmas Service will be held at Edison Park Lutheran Church, 6626 N. Oliphant Avenue, Chicago, IL 60631. This special holiday service features Pastor Karen Knutson, Bjornson Male Chorus, Organist Matt Haider and fellowship & refreshments afterwards provided by Danish Sisterhood Dagmar Lodge #4 of Chicago. 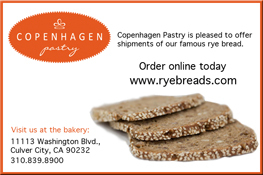 Come celebrate the 25th Anniversary of this Danish tradition in Chicago!